We've released the Seeed Relay Selection Guide, it will help you choose the relay that best suits your needs. 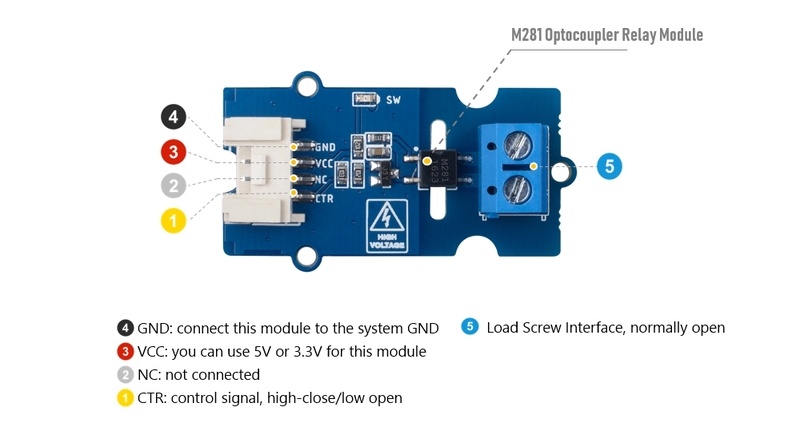 This module is a bi-directional SPSD(single-pole, single-throw), normally open solid state relay(SSR). The Grove Optocoupler Relay (M281) offers very low on-resistance, which allowing a high load current rating. and DC load. If you need to use a SSR with the DC load, this is what you want! Cost-effective: Usually, the price of a single-channel SSR will exceed $10, and the price of this module is less than half. This is the wiki page for this product, which will show you how to use the product, as well as details about the software and hardware.